Enrich your Omaha Community Playhouse experience by joining ACT II! Membership in ACT II offers a wide range of fun opportunities to maximize your social and volunteer experience. For over 20 years, ACT II has been an integral part of OCP’s success helping with fundraising, community enrichment programs and educational programs. 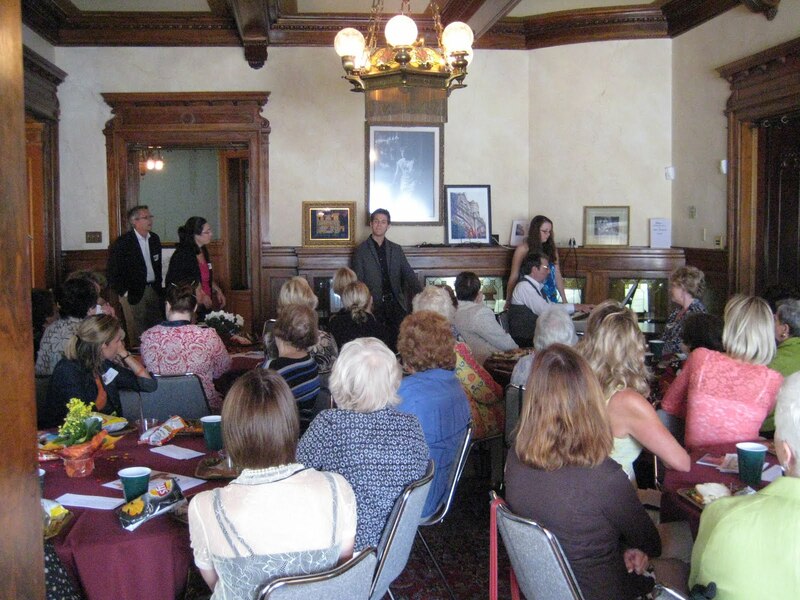 Throughout each season, ACT II hosts several luncheons which focus on the plays in the current season. These entertaining and informative events begin this season on Monday, Sept. 12, with the Fall Kickoff Luncheon featuring entertainment from Chicago. On Monday, Oct. 10, the first Behind-the-Scenes Luncheon will give attendees a glimpse behind the scenes of Flyin’ West. A second Behind-the-Scenes Luncheon will be held in the spring on Monday, April 9 and will feature Lend Me A Tenor. ACT II will wrap up the 2011-2012 season on May 14, 2012 with its annual Spring Luncheon featuring the entertainment of Hairspray. In November, ACT II is planning a variety of events featuring guest lecturer, Dr. Elliot Engel. Dr. Engel is an expert on Charles Dickens. Start your holiday season off by attending one of the special Dickens events Friday, Nov. 18 and Saturday, Nov. 19. Watch for more details coming soon. The fun doesn’t stop after the holidays! In February, ACT II will once again sponsor the very popular ACT Out! Children’s Workshops. This day-long event is designed to introduce children to the excitement of live theatre. Our very popular Destination: World’s Fare Benefit will be held Saturday, March 31, 2012. Guests experience the food and entertainment of different countries around the world as only OCP can do. ACT II has a very full and exciting year in store! Many volunteers are needed to make these events successful. As a way of saying thanks for all their work on behalf of OCP, ACT II members will receive a 20% single ticket discount for all OCP productions. If you are interested in learning more about ACT II, contact Jan Fry at jfry@omahaplayhouse.com or (402) 553-4890, ext 145 or visit www.omahaplayhouse.com. The Playhouse’s rich tradition in the Omaha community was made possible through the support of friends like you. Now it’s time to prepare for the next chapter of our great story. The Omaha Community Playhouse is currently in the midst of an Endowment Campaign to raise enough funds to ensure that our high-quality productions and programs are available for future generations. Please consider making a financial contribution to this important endeavor. 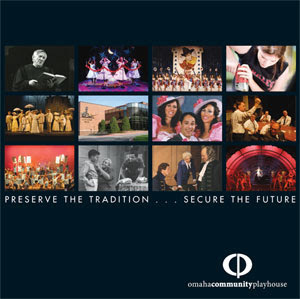 To learn more about why we feel it’s the right time to “Preserve the Tradition and Secure the Future” of the Omaha Community Playhouse, click here. Your gift can make a significant difference towards our campaign goals. In addition to providing a stable source of future funding for OCP, your endowment gift will also currently help us complete a three-year matching donor challenge to receive an additional $400,000 in general operating support for the Playhouse. There are two great ways to help…either a general endowment gift (click here to make a secure pledge online) or a gift to “Sponsor a Seat” in the Hawks Mainstage (click here for more details). Checks can also be mailed to 6915 Cass Street, Omaha, NE 68132 to the attention of Alena Furlong, Development Director. The Omaha Community Playhouse is still here after 87 years and relevant to our community today through your support and commitment. We thank you for your consideration and hope we can count on your continued support. Thank you for being part of the Playhouse family. OCP Props Garage Sale: Relive the memories! For years, the props used in Omaha Community Playhouse productions have been awed and revered by actors and audience members alike. Whether the props are extravagant and outrageous or exquisitely simple and detailed, props add a unique mixture of magic and reality to any show. But often times, a prop is in one scene and out the next. Never to be seen again. Lost in closets of time and set storage. But wait! Now is your chance to not only see them again, but to have them for your very own! That’s right, OCP is holding a properties sale, and it’s all up for grabs! Wednesday, August 3, 10 a.m.-5 p.m.
Thursday, August 4, 10 a.m. -7 p.m.
Friday, August 5, 10 a.m. – 5 p.m. Whether you have been in an OCP show before or have been an audience member enchanted by the magic of theatre, don’t miss out on this opportunity to relive the memory and take a piece of it home with you! Questions? Contact the Omaha Community Playhouse at (402) 553-4890. It’s Wednesday night and you’ve got 16 pages of lines, seven songs, and four dances to memorize before Friday afternoon. Sounds like a challenge even the most seasoned actor would find overwhelming. Now imagine you’re only 12 years old and it’s the middle of July! 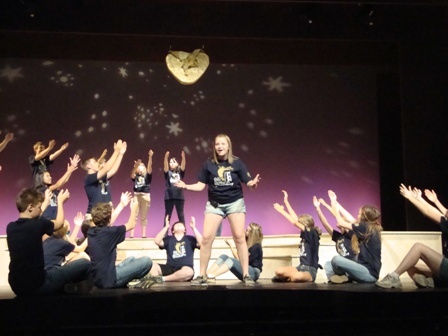 The above scenario is typical for any of the students participating in OCP's popular First Stage Summer Theatre Academy. Started in 1997, the academy takes place over the month of July with two different two-week sessions offered to students ages 12-18 who want a more intense performing experience. For two weeks, students will work intensively with members of the First Stage production team in a “summer stock” setting. Each session includes daily warm-up activities, auditioning workshops, improvisation exercises, dance classes and vocal/blocking/choreography rehearsals. They work with professional directors, musicians, choreographers and technicians from OCP and become part of an original production written specifically for First Stage. On the final Friday evening, the production is presented in the Howard and Rhonda Hawks Mainstage Theatre for an invited audience of friends and family. It isn’t easy – the directing staff asks these students to stretch themselves as both performers and young adults on a daily basis. The goal (aside from having a great time!) is that these young performers gain a better understanding of the hard work and commitment needed to stage a production in only 10 days. Academy participants leave with the sense of accomplishment on a job well done and rush of adrenaline that only performing on stage can provide. It’s not uncommon for students to return year after year or to audition for future Playhouse productions. If you know of a student who is just itching to get on stage, spaces are still available for our second session, which runs July 19-29. Students may register online at www.omahplayhouse.com or by calling the Education Office at (402) 553-4890 ext. 131. Enjoy the arts with a Metro Arts Pass! If you are a season subscriber to the Omaha Community Playhouse, in the month of July, you can receive $1 off admission per person at Joslyn Art Museum. 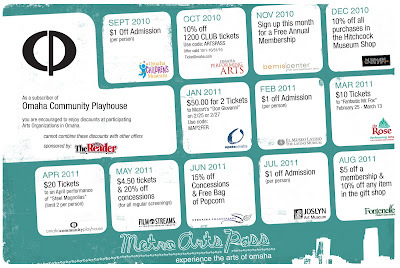 The Metro Arts Pass is sponsored by The Reader and features various nonprofit arts organizations around Omaha. 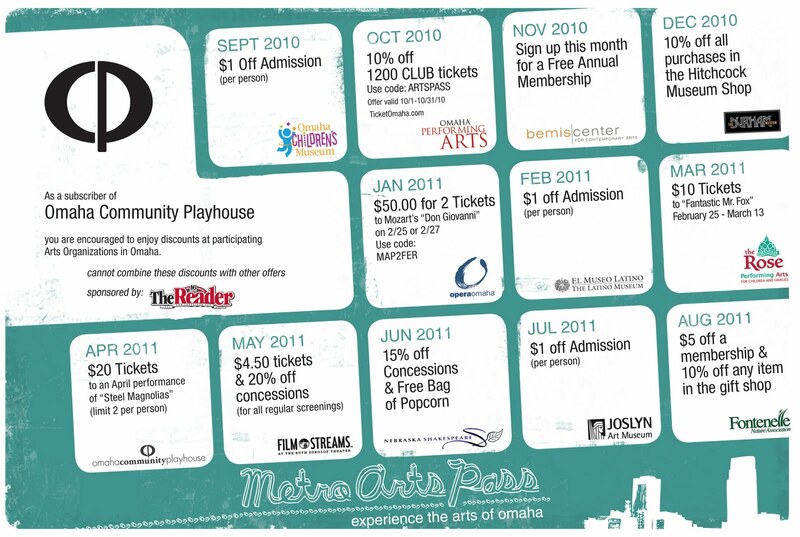 In order to be a Metro Arts Pass member, you only must be a member or subscriber to one of the participating organizations. Every month, OCP members can enjoy a discount at a different featured Omaha arts organization. For more information about the Metro Arts Pass, contact the Director of Sales at lkaup@omahaplayhouse.com or (402) 553-4890, ext. 147.